What version of the Boston Celtics would we tonight, against the lowly Atlanta Hawks, currently in 12th place in the comparatively weaker East? In recent weeks, the team has gone on losing streaks to sub-.500 squads we will not mention based in Florida, but also taken down some of the league's best teams - would the lessons ostensibly learned in dramatic fashion stick against exactly the sort of team Boston's had a bad habit of playing down to of late? The early results were not promising, with John Collins, Kevin Huerter, and Trae Young leading the Hawks to an early 11-20 lead by the halfway point of the first quarter. With long scoring draughts for much of the backside of the initial frame showing after grinding out a solid win over the Memphis Grizzlies the night before, the team had to rely on Kyrie Irving to stay in the game. 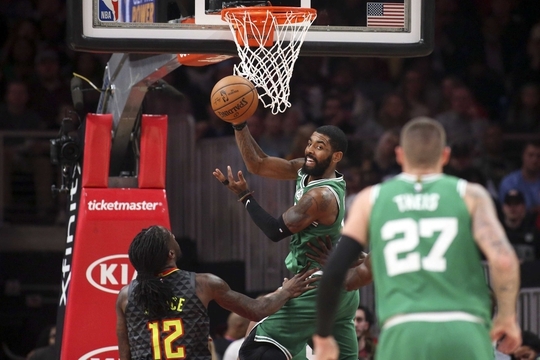 The second frame began with Atlanta up 36-28, and saw Irving continue to shoulder the load while his teammates struggled to score, save Jayson Tatum early in the quarter, and Daniel Theis late. At one point, Boston fell behind by as much as 16 points behind a Dewayne Dedmon layup, but Kyrie, Marcus Smart, and Al Horford cut the lead to 67-60 going into halftime. The third quarter started, with a Collins and-one putting the Cs back down ten. Irving stepped up yet again, however, sinking a trey on the proximate possession. With little help until Tatum began to heat up, Boston still managed to cut it to a single possession just inside the seven-minute mark with the former Duke wing making a trip to the stripe. Atlanta fought back, however, with Taurean Prince, Jeremy Lin, and Alex Len all getting warm from the floor, pushing the lead up to double digits late in the quarter. Jaylen Brown, Semi Ojeleye, and Aron Baynes cut the lead to just six points, starting the final frame down to the Hawks, but by a manageable two possessions. Vince Carter continued to defy father time with a slick layup that seemed to energize Terry Rozier, who responded with a trey off a Brown assist, and a dunk shortly after. Brown himself came alive in the fourth, scoring seven in the first four minutes of the frame, and helping Boston to retake the lead for the first time since early in the game. Clutch play from Irving, Horford, and Tatum fended off the last gasps of an overachieving Hawks squad that ought to be better at losing, Boston winning 113-105. The Cs next face the Miami Heat at home this Monday, January 21st at 5pm EST.